The RMT Club is a revolutionary new piece of fitness equipment on the scene from WeckMethod, who brought you the fantastic BOSU Ball now found in gyms throughout the world. Here at AskTheTrainer.com, we took 30 days to test the RMT Club for ourselves. We also busted it out during personal training sessions with clients with different needs and goals to see how they liked it. Our verdict: WeckMethod has done it again, offering another unique fitness tool that can benefit anyone from a casual exerciser looking to lose weight and improve general fitness to an elite athlete seeking to improve specific aspects of their performance. The RMT Club puts a fun and different spin on functional training and high intensity interval training (HIIT) workouts while improving core stability and athletic power. Read on to find out what the RMT Club is, what you can do with it, who can benefit from using it, and more. What is the RMT Club? First, let’s talk about RMT: Rotational Movement Training. RMT is an exercise style and philosophy developed by David Weck and the people at WeckMethod. In RMT, you focus on functional exercises, with the goals of unifying both sides of the body, integrating the senses, finding internal balance, and building core stability and strength. The net effect of RMT is heightened overall fitness levels, greater mobility, improved athletic performance, and prevention of injuries. We at AskTheTrainer.com believe RMT to be effective for advancing these goals. Alongside the already-popular BOSU, the RMT Club is a key tool in Rotational Movement Training. The RMT Club is intended stand on its own or be integrated with BOSU workouts. It’s literally a club made out of a durable material that stands up to repeated swings and slams. Currently offered in 2, 4, and 8 lb models, we found the deceptively “light” weights to be effective for getting a full-body functional workout with a strong cardio component. What’s Unique About the RMT Club? A unique feature of the RMT Club is that it’s filled with pebble-like material so you get auditory feedback as you’re performing the exercises. The same exercises that sound smooth on your dominant side will cause audible shaking from the club when performed on your non-dominant side. You can use this sensory feedback to smooth out your movements and improve the performance of your weak side. Another cool feature is that you can actually smack things with it! This allows you to build explosive strength as well as improve your control. We slammed heavy bags, tires, and the floor (just put down a mat first for flooring that could be damaged by impact). It was fun and exhausting, and the club’s durable construction took all the impact like a champ. What Kinds of Exercises Can You Do with the RMT Club? The RMT Club can be used as a stand-alone product for a full-body workout, or certain RMT Club exercises can be worked in to complement more traditional workouts or workouts with specific goals. Some fun and effective RMT Club exercises we tried included ground strikes, samurai squats, lunges, the scoop, the bailer, the windmill, and the shoulder-to-shoulder swing. Don’t know what these would look like or how to perform them safely? No worries, because the RMT Club is shipped with a wall chart of recommended exercises, plus a DVD which contains a 40-minute workout and a breakdown of 21 different exercises. You’ll also get access to an online library of exercises from WeckMethod. We picture the wall chart being extremely helpful to exercisers when posted in commercial gyms. The DVD and online library are best suited to help guide home users. Personal trainers can become certified in the use of the RMT Club with their clients, as well as the BOSU Balance Trainer and other aspects of the WeckMethod. Continuing education credits are available for many certifying organizations. Trainers can find more details on certifications offered by WeckMethod and register for upcoming trainings at www.weckmethod.com. Who Can Benefit from Using the RMT Club? Since the RMT Club is affordable, versatile, portable, and effective, we think it’s a good choice across the board for personal trainers, small independent gyms, large commercial gyms, and home exercisers. For those looking to develop a lean and toned physique, the RMT Club integrates full-body strength training with cardio to build muscle while burning a good deal of calories. Those looking to build sheer muscle mass will still, of course, want to base their workouts on the heavy lifts and any specific isolations they are looking to develop, but the RMT Club could be added as complement to balance out heavier strength-training workouts, ensuring that mobility is maintained and quality of movement isn’t compromised. 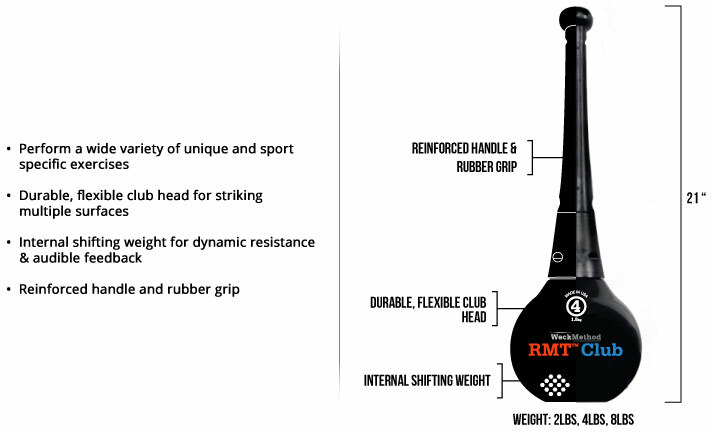 Specific athletes that can benefit from RMT Club Workouts include basketball players, boxers, golfers, crossfitters, tennis players…essentially anyone looking to improve rotational movements, explosive force production, and muscle control can benefit from adding the RMT Club to their arsenal of training tools. Home exercisers can learn how to use the club using the included DVD and online exercise library. Once the foundations are learned, the club can be taken outside for a full-body workout in nature. It’s a good idea to bring a mat to lay down for ground strikes. For a personal trainer working in a gym or offering mobile training services in-home or outdoors, the RMT Club is a good choice. It’s portable and lightweight, making one or more clubs easy to stash in a trunk or backseat of a car alongside other portable training tools a trainer may need to cart back and forth, such as BOSU ball, stability ball, and resistance bands. Where Can I Purchase the RMT Club? 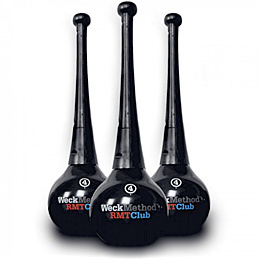 You can buy the RMT Club directly from the WeckMethod website and other sources including Amazon. Click here to visit the RMT Club product page to learn more about this awesome tool. TIP: If you’re a personal trainer or gym owner, be sure to check out the 3-Club Set which includes the 2lb, 4lb, and 8lb club. This bundle will not only save you around $30 but it will also ensure that your clients have a range of options to choose from. Now if you have a limited budget and/or are not sure which club to buy, the middle range 4lb club may be ideal for you, especially if it is going to be used by more than one person. The 4lb club is a great balance between the super light 2lb club and the heavier 8lb club so it will work well for most individuals. The RMT Club is a useful tool that can be used in functional strength training, mobility training, high intensity (HIIT) training, training for specific sports, and more. There are a lot of gimmicky fitness products floating around out there that are a waste of your time and money, but the RMT Club is not one of them. At first glance, the RMT Club may look a little funny, but try out an RMT Club workout and you can experience the unique benefits for yourself. Don’t be surprised if you see RMT Clubs cropping up around the BOSUs in gyms everywhere as the fitness world catches on to this hot new product.